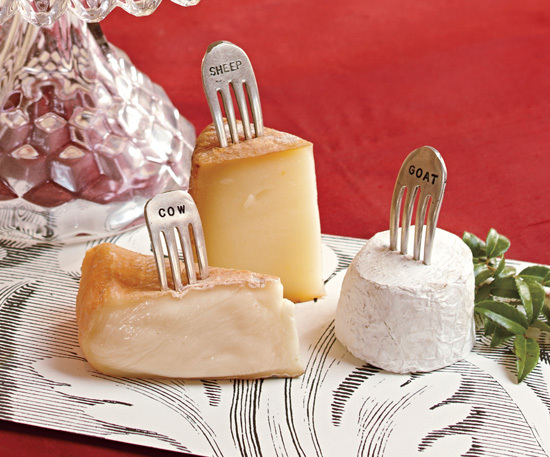 This gift guide is an eclectic mix of well designed items with a little something for everyone. Most items are under $100. 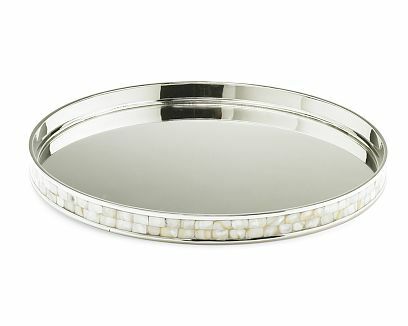 For those on your list who are into entertaining (or cocktails) this campaign style black lacquer tray or mirrored mother of pearl tray would be great on top of a chest or table to corral barware. 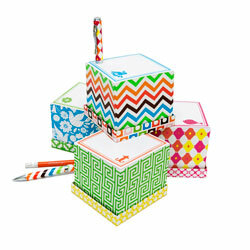 Graphic note cubes and pens are fun and make cute stocking stuffers. 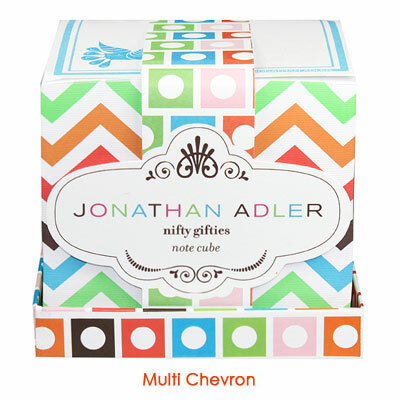 Especially love the colorful chevron pattern! 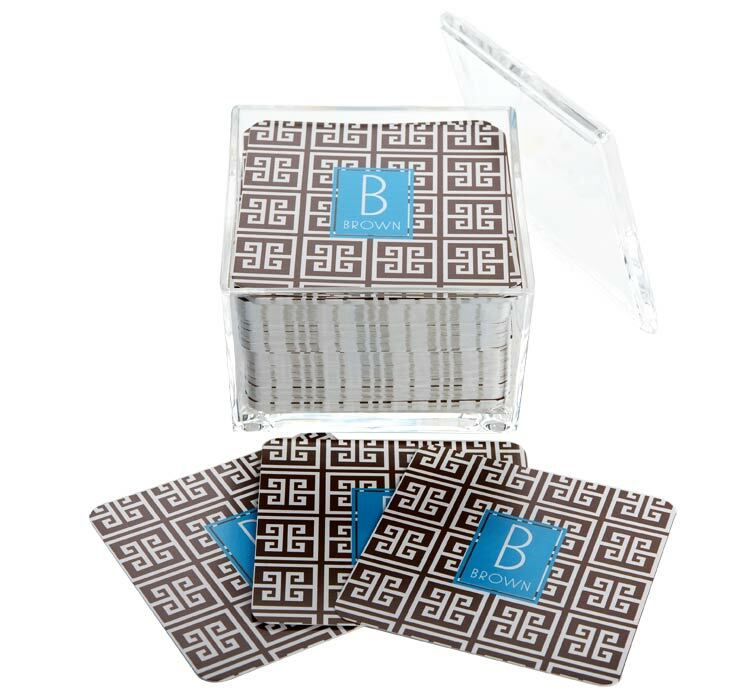 Personalized note cards or monogrammed drink coasters are available in a slew of patterns, contained in a cool lucite box and make excellent hostess gifts. 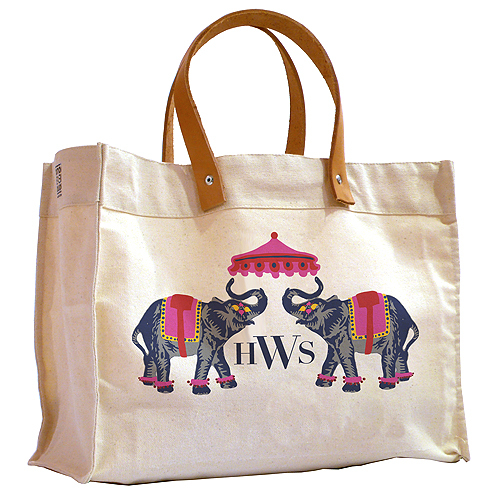 Another personalized item that is chic and so useful is this tote – it’s available in a ton of designs and fonts styles as well as 5 sizes. There is also an option to upload your own design. Here are some of my favorite designs, but there are many great ones! 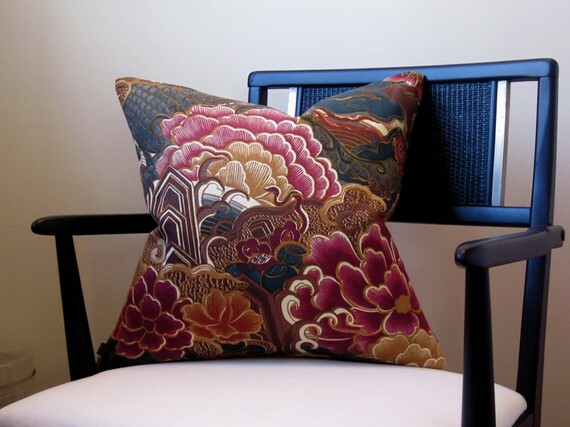 An easy way to add life to dull a space is to incorporate decorative throw pillows in designer fabrics. 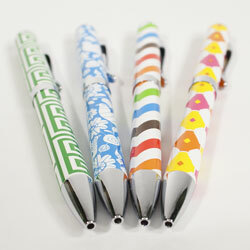 Etsy is a great resource for such items and recent finds include a colorful print (I want this! 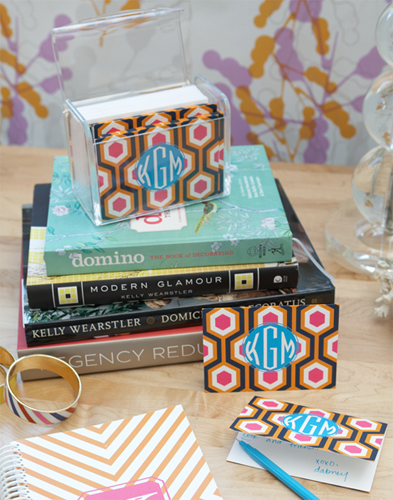 ), ikat pattern and Greek key and trellis pattern. Look for pillows that have concealed zipper closures which are more tailored looking than the envelope back. 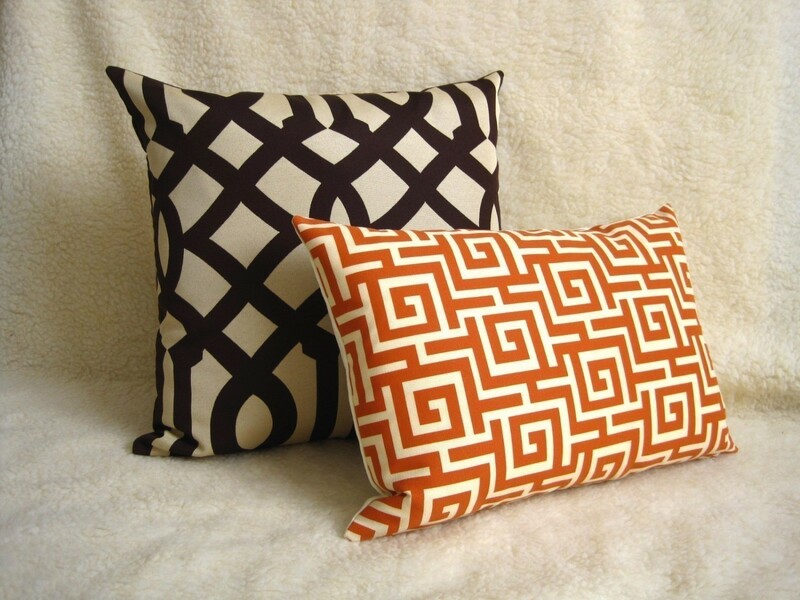 Some sellers include the pillow insert and others only sell the covers so be sure to read the details. For a stylish sister, best friend or woman in your life who appreciates feminine and romantic pieces, these handmade flowers are made of linen with a brooch pin back that can be worn at the waist or lapel. Pretty! 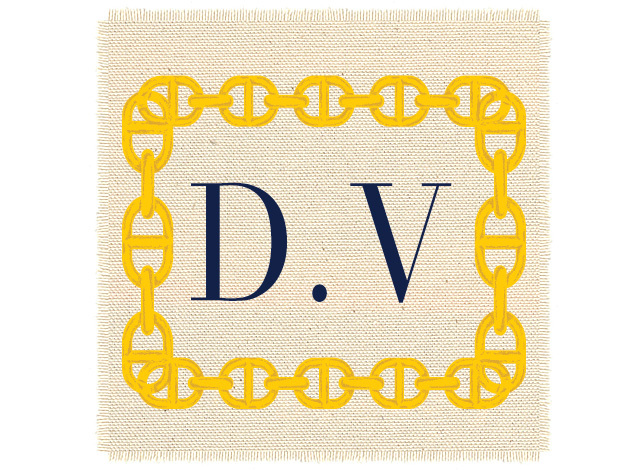 If you are looking for beautiful, relatively affordably priced jewelery, I love this local Boston designer. 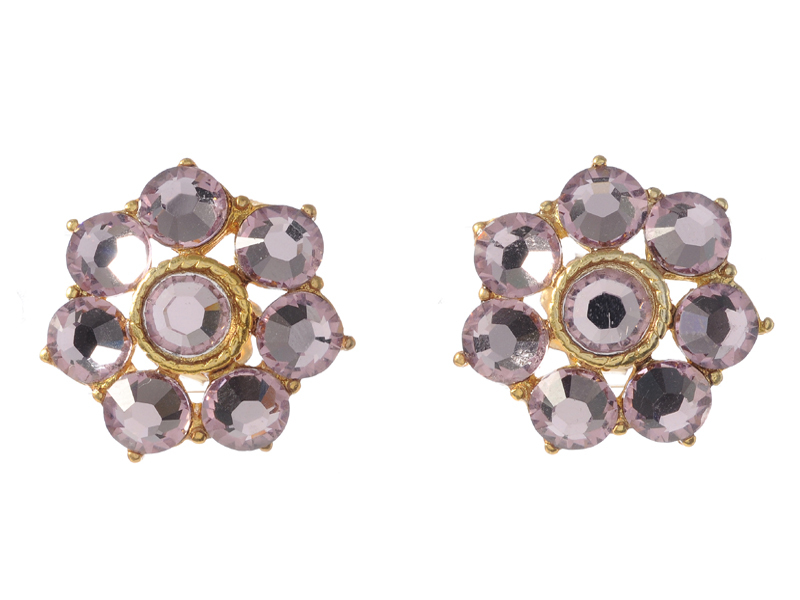 These earrings seem tiny from this image but they are oversized and absolutely gorgeous (I’d love these!). Available in a bunch of colors. 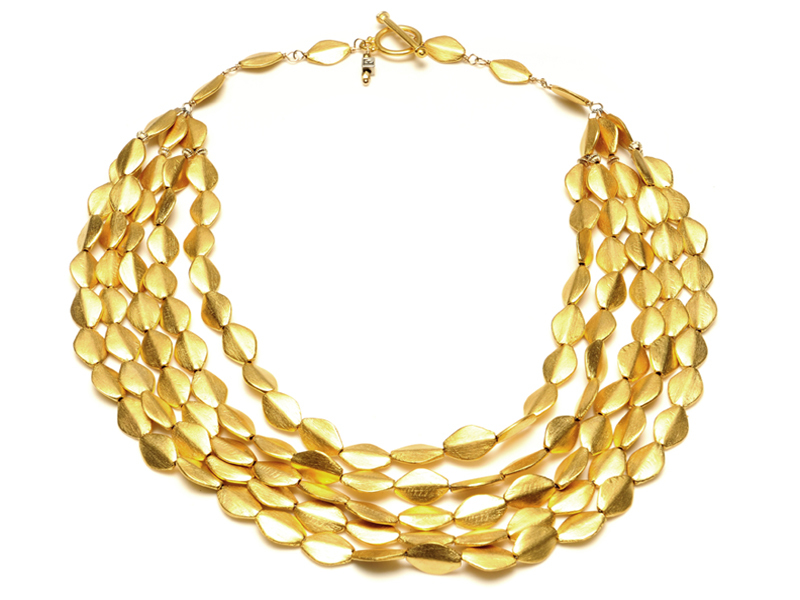 This necklace is another stunning piece. Love it! 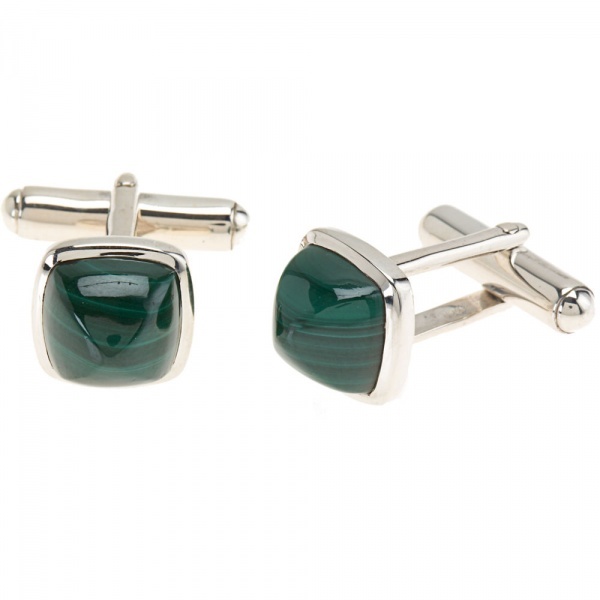 And some bling for the guys, these agate or malachite cufflinks are understated, classic and elegant. 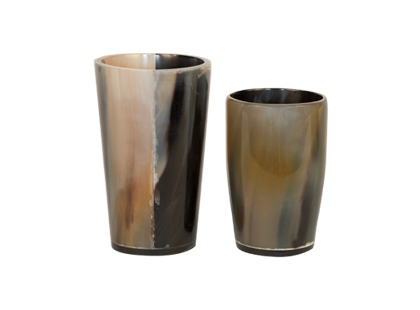 I love natural horn home accents and these cups would make a great desktop accessory for pens/pencilsn and the bowls make chic serving pieces or to corral jewelery on a vanity. 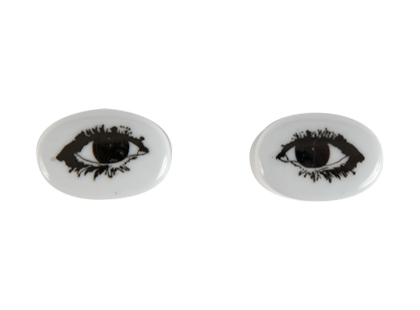 These eye boxes are a funnier alternative to the standard plastic contact lense case. 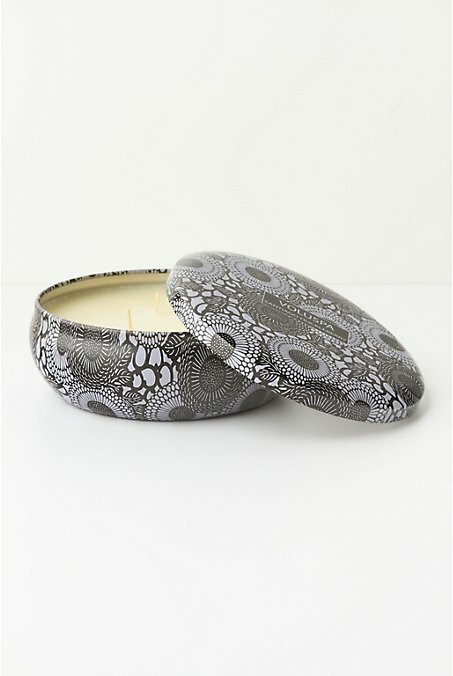 Voluspa candles come in pretty tins and smell divine! Love the huckelberry! 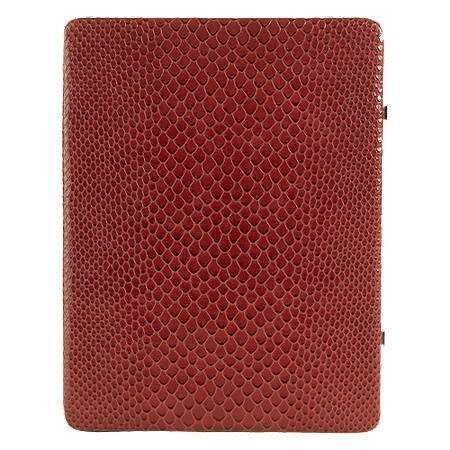 Many people already have or will be receiving ipads this year and a cover that matches their style is a great gift! Here are a few that are really great. 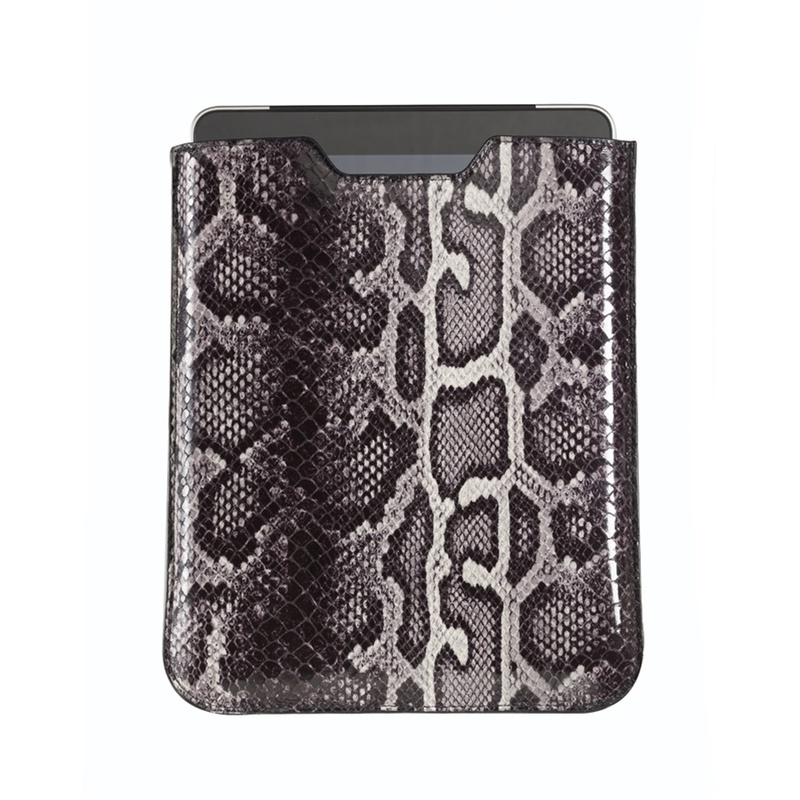 For fashionable ladies, this ipad frame case is a classic choice while a python embossed sleeve is more bold. 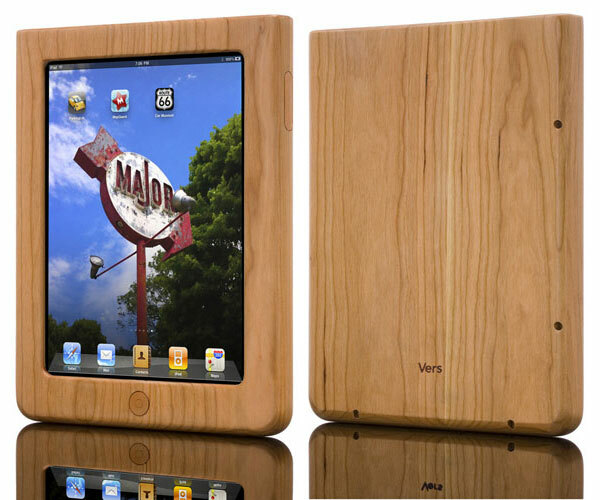 A handcrafted wood case would be great for a guy and is available in a few species. 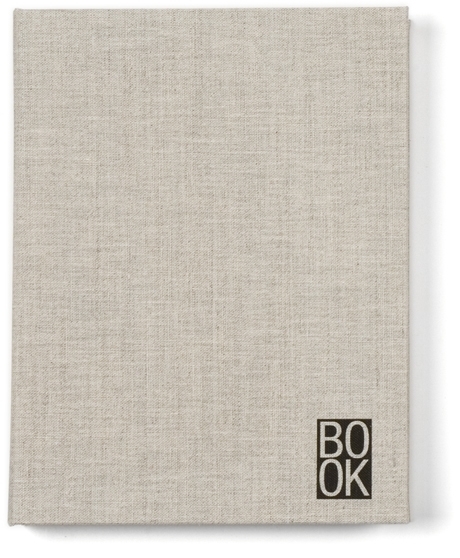 And this beautiful hard book version is customizable – you can choose your own ‘book’ title for the cover and spine. The example on the website read “This is not a Book”. Great for a guy or girl! 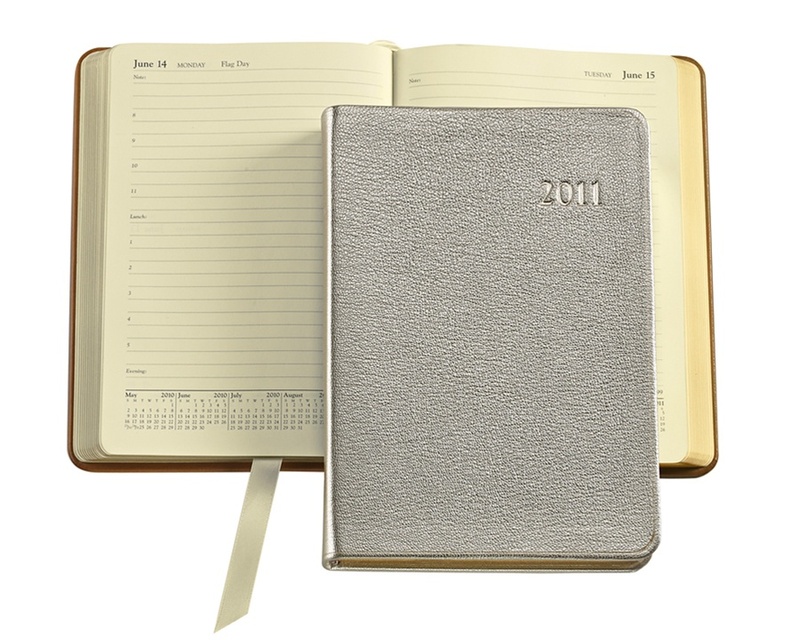 For those on your list who still love to actually write things in a daily planner (like me! ), this is my favorite – metallic goatskin leather, perfect size to tote around in a handbag (I always carry a large bag anyway). I get one each year, personalized with my first name and my color choice for 2010 was the metallic white gold. 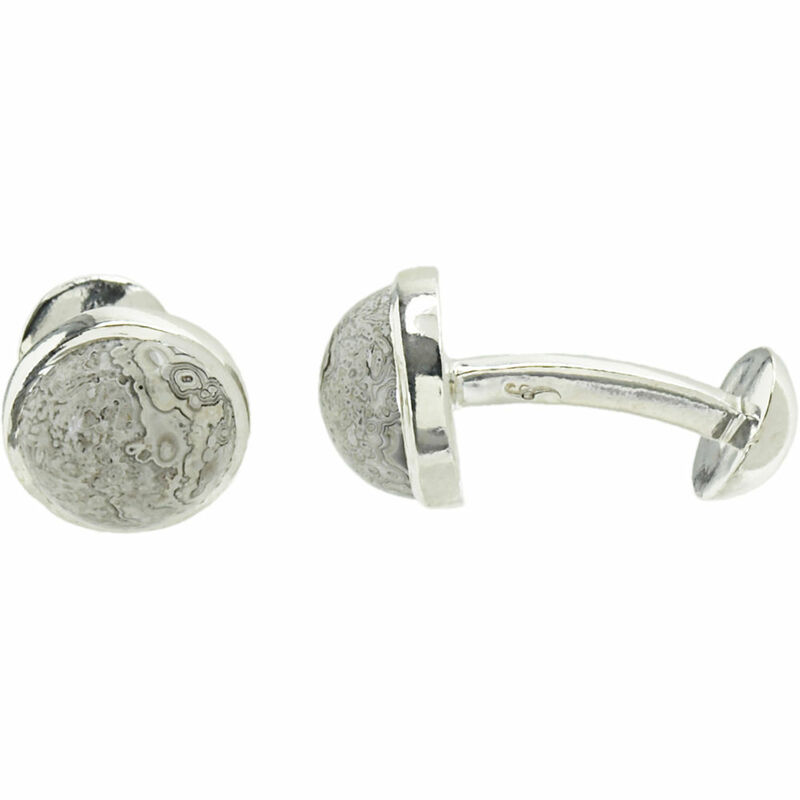 Not trendy, totally classic – LOVE this! *non metallic colors also available. 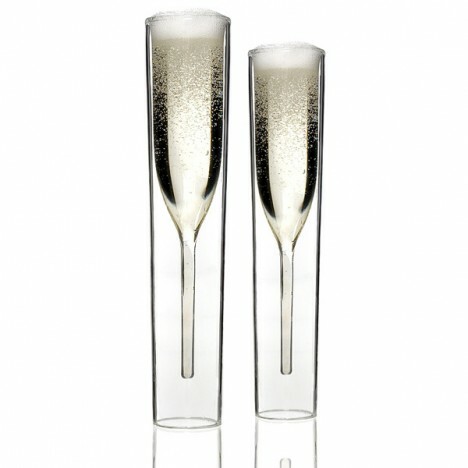 InsideOut champagne glasses by Dutch, Brooklyn based artist Alissia Melka-Teichroew have a modern cool aesthetic while these Venetian style flutes are gorgeous and delicate. 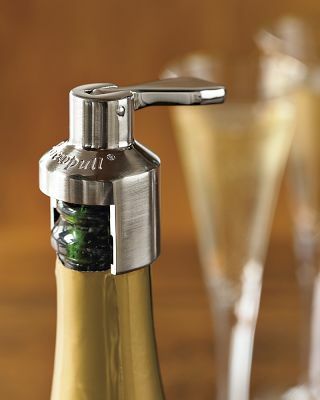 Another gift for Champagne lovers is this resealer possibly paired with their favorite bubbly! 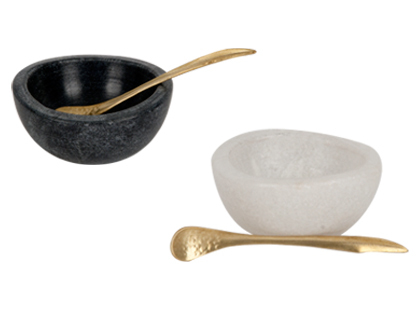 Marble salt and pepper dishes come with brass spoons and would be a great gift for the entertainer or chef. For travelers who are environmentally conscious (hopefully most of us! 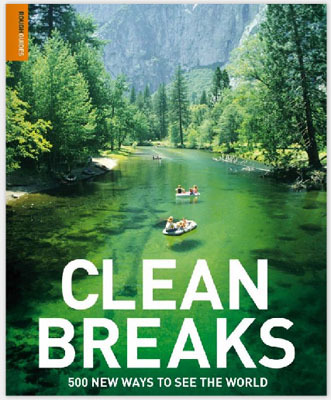 ), this book offers tips about how to minimize environmental impact while travelling and details 500 trips. Awesome! Hope this gives you some good ideas! 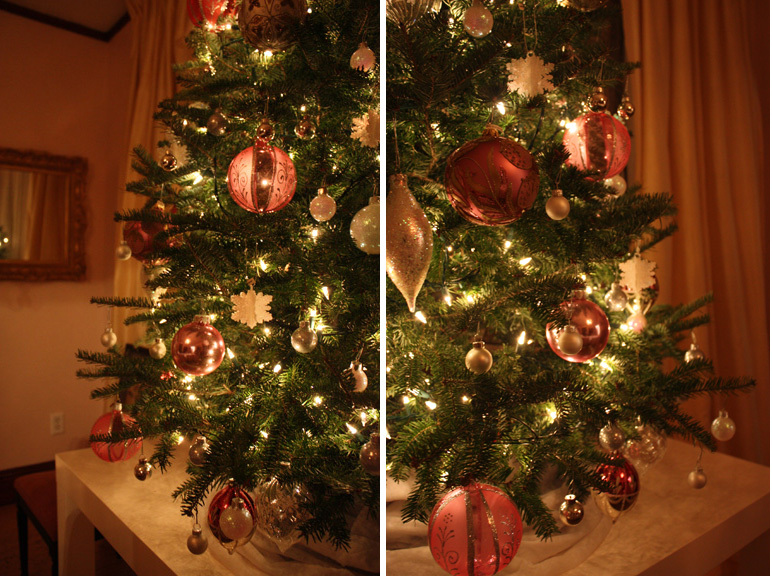 Put the tree up over the weekend, downloaded some Christmas music and am really getting into the Christmas spirit! I didn’t get the full size tree that I normally do for various reasons but the main one being that it needs to come down by Dec 20th because I’m going away. So, I opted for a small tabletop version instead and while this idea seemed half-hearted at first, I’m pretty pleased with how it turned out! My white parsons table worked out perfectly. Below are a couple of detail shots – some of the ornaments are hand made painted glass from Poland and the color scheme of silver, gold and pink coordinates with the interior. 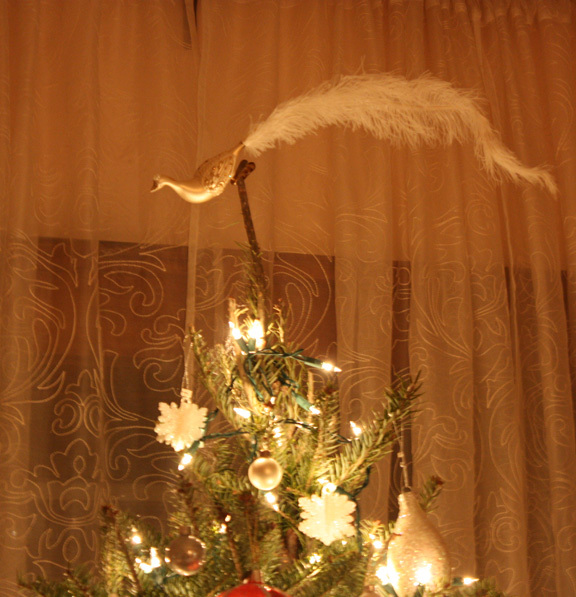 And a tree is not complete without a fabulous treetop ornament like this feathered bird I’ve been using for years. 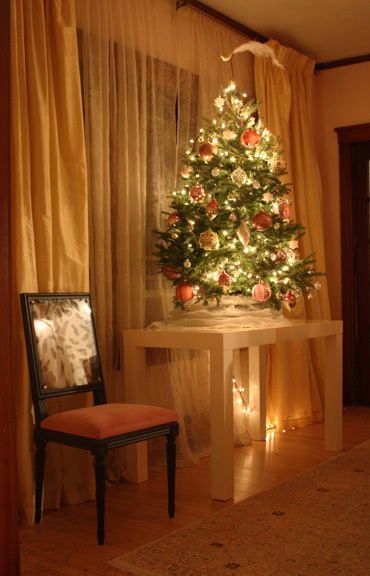 Anyone else go for the tabletop tree this year? What kind of ornaments do you use? 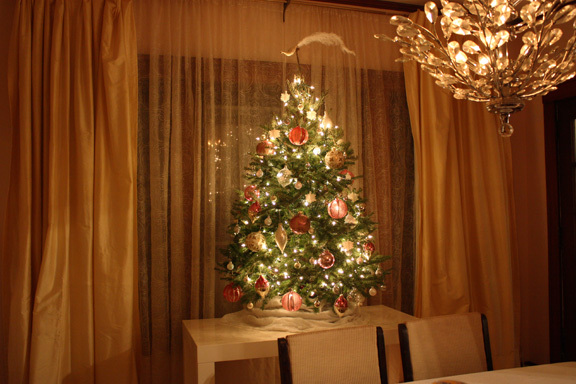 Would love to hear about your holiday decor. Hope everyone is getting into the holiday spirit! 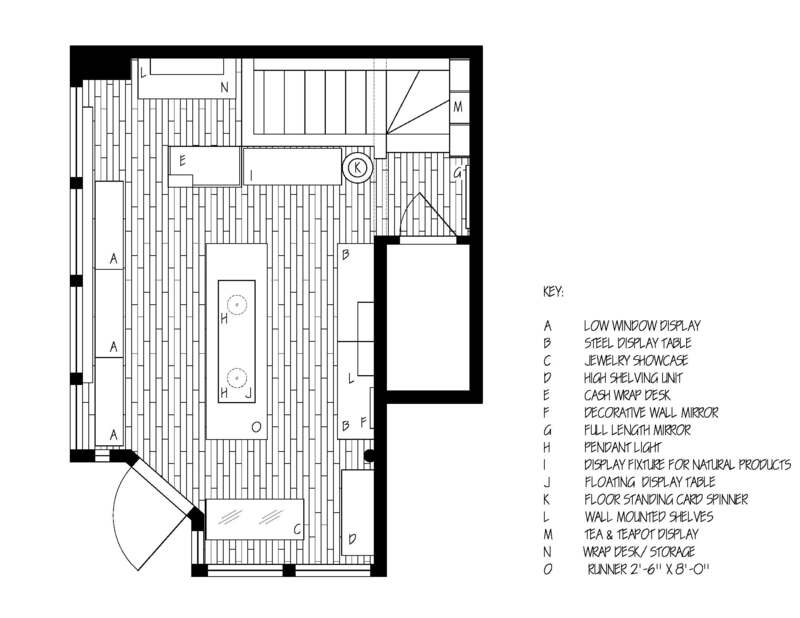 However, it’s a small space that would have a wide assortment of items (kind of like mini-departments) for sale so the main goal and design challenge was to develop a floor plan that allowed for maximum display without feeling cluttered. 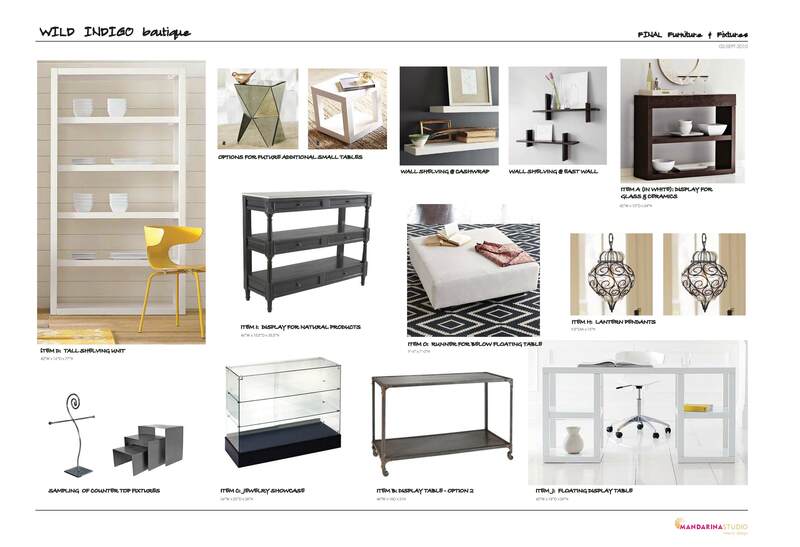 The diversity of the merchandise called for several types of display units and fixtures as shown on the Design Board above. 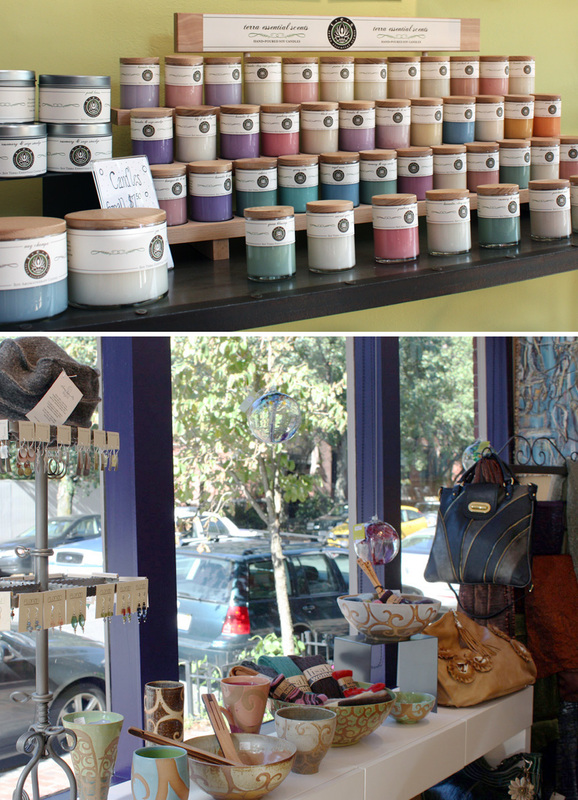 The boutique carries beautifully hand-crafted pieces and many of the artists are exclusive to Wild Indigo. 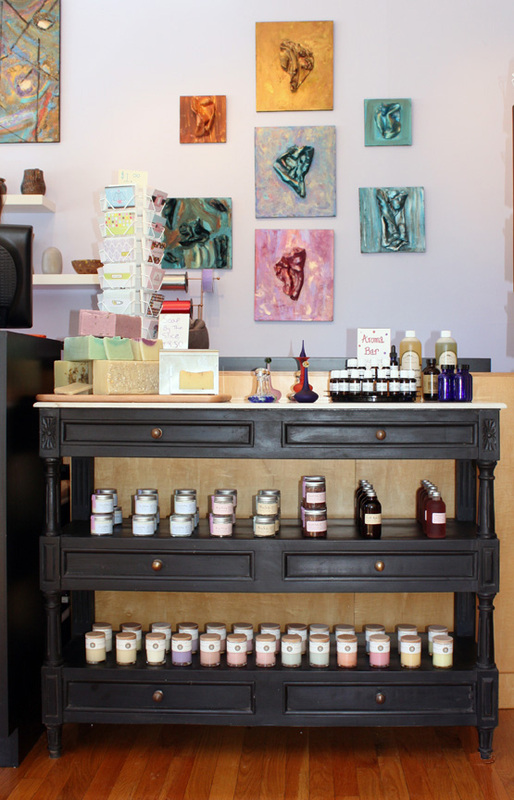 One of the ‘mini departments’ features natural products including a Soap Bar, Aroma Bar, Tea Bar and fabulous soy candles that melt into a lotion. This French antique style marble top tiered console pictured above neatly displays the natural products and evokes their hand-made quality. 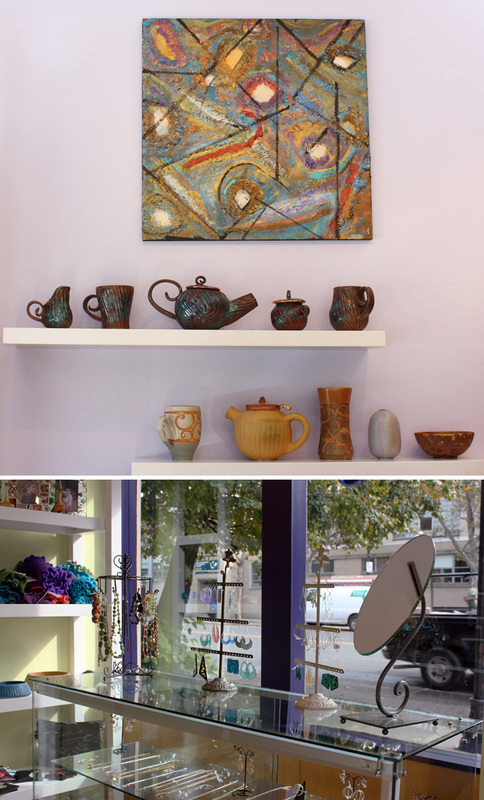 Another ‘mini-department’ includes the “Ceramics” by several artists who create amazing one-of a kind pieces including teapots, tea cups, vases, soap dishes and even dog & cat bowls. The “Glass Art” items include beautifully delicate pieces such as perfume bottles, ornaments and diffusers which make great hostess gifts. 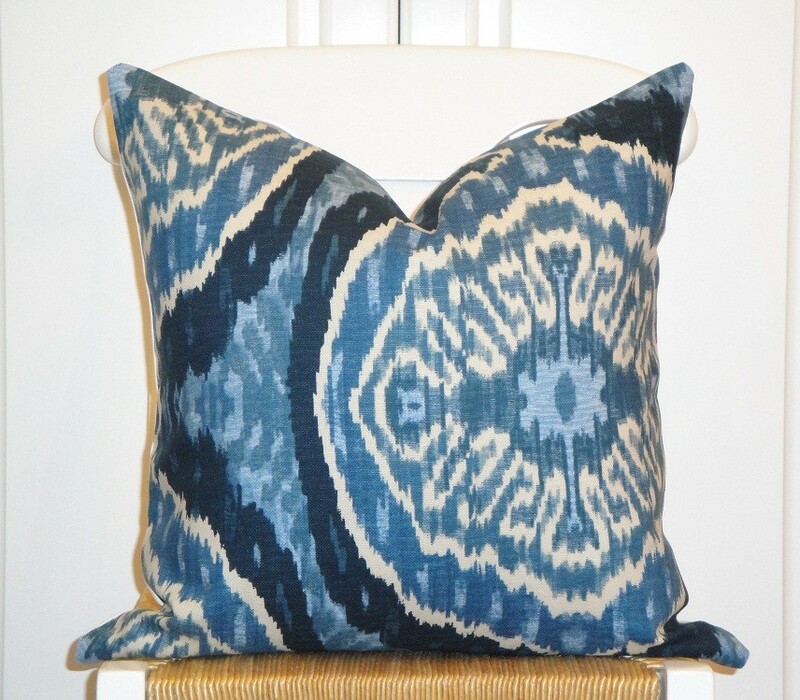 In addition to home items, Wild Indigo also offers fashion items including knit and silk scarves, hats, gloves & armbands and well-priced vegan handbags which are in huge demand right now. The white lacquer center table in the photo above works as a focal point and also helps to direct a traffic pattern around the boutique. The focal point is highlighted by a pair of Moroccan style pendant lights and is anchored by the over-scaled ikat black and white runner. The top image is a detail of the candle display which sits atop one of the distressed steel tables. We juxtaposed the stark white lacquer display units with distressed steel, french antique style console and iron accents such as the pendant lights and jewelery table displays to add interest and richness in the space. The top image is the focal wall behind the cashwrap. The floating shelves are intended for a rotating display and the artwork is by Christina Murphy. The bottom image is the frameless jewelry showcase which houses some of the more expensive pieces. To maximize the display area, we specified a full showcase which means it has three shelves and is entirely glass except for the black base. 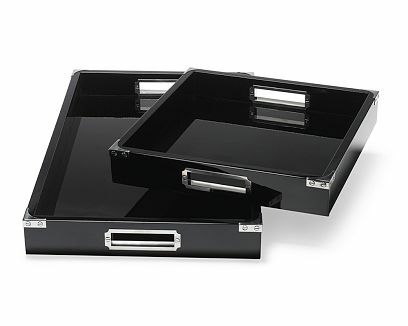 [ This frameless type of display case without the unattractive metal edges and corners is definitely the best looking type of jewelry showcase that is readily available. I highly recommend them for occasions where custom showcases do not work with the timeline or budget]. Hope to see you at the opening party! Buenos Aires has been on my list of places to go for a while so I was beyond thrilled when we decided to go last minute and booked a trip about a week before our departure date. As most of my family and friends know, I LOVE to plan and spend a lot of time researching for trips – it’s really part of the fun and experience for me. So, without the time to do ‘proper’ research, I consulted my go-to sources and selected accommodations (we rented an apartment in Recoleta), booked concert tickets and left the rest to decide upon our arrival. And, though I typically never travel without it, I decided not to bring my laptop (no technology for 2 weeks!) but went armed with a few travel books and plenty of printouts. 1. 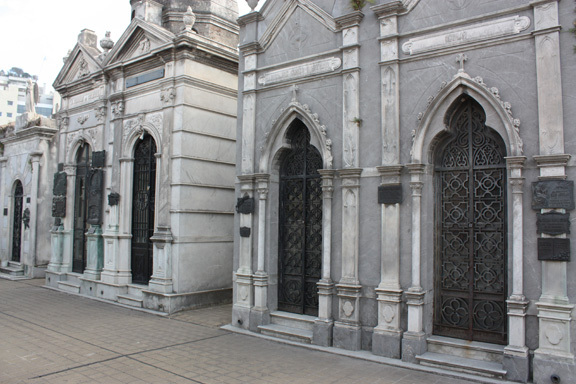 Visit the Recoleta Cemetary which is one of the most important cemeteries in the world and the resting place for Eva Perón. It is like a small city and like no other cemetery I’ve seen. Probably the top tourist site in the city. 2. 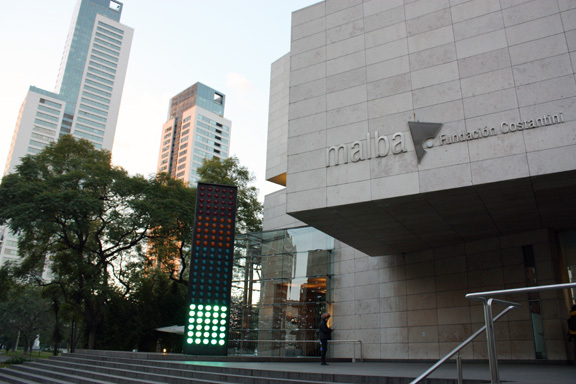 Visit the MALBA, BA’s contemporary art museum and cultural center. Definitely have a lunch or a cocktail at the cafe here, Café des Arts, a lovely space with good food and chic people. Highly recommend the cafe. Sibyl Vain Hip designs, well-priced shoes and bags. I picked up a pair of heels and almost bought boots as well. Multiple locations throughout BA. Divia Small boutique in the trendy area of Palermo Soho. I loved all of the shoes here, picked up pumps and could have swooped up more. Lucila Iotti Another small boutique in Palermo Soho. I regret not getting something here – I don’t know what I was thinking because I love the designs in these photos. Casa Lopez Excellent quality leather bags, accessories and jackets for men and women. The designs are a bit boring, however. This company could use a re-branding, especially their logo which is not appealing and is embossed on most bags. Could be a good resource for leather jackets though. Multiple locations throughout BA. Rossi & Carusso Similar quality to Casa Lopez but a bit more modern feeling – more classic than trendy though. Leather bags in orange are striking – picked up a new ‘briefcase’ which I’ll use to tote my laptop. Multiple locations throughout BA. Mi very cool shop in Palermo Soho. Unique and fun designs. Especially loved this convertible bag which I now own in the british tan leather/green suede combo. 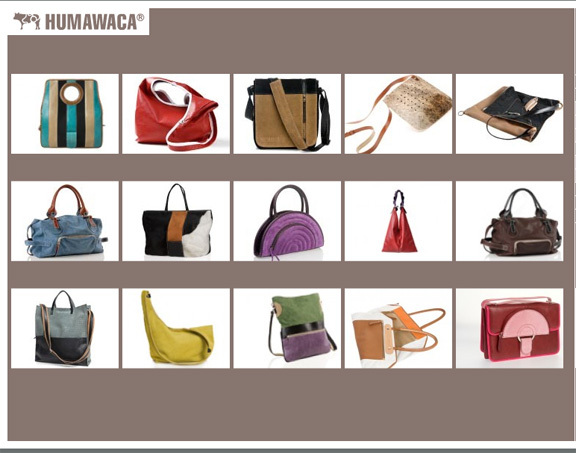 Humawaca offers handbags and accessories in cutting edge designs using the best Argentinian leather. Locations in Palermo and Recoleta. 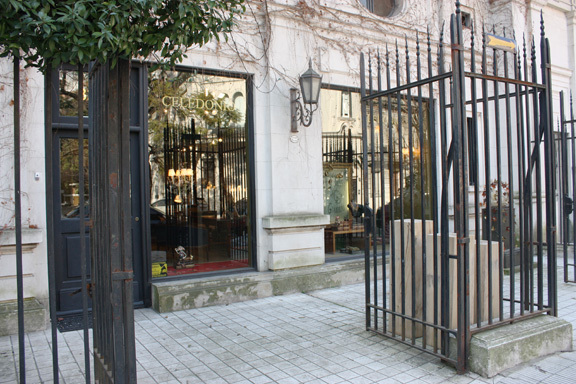 Fosca (Gurruchaga 1726, Palermo Soho) Palermo boutique good quality bags and shoes for women. Most designs are pretty classic but I lucked out with a pair of salmon colored low boots that have beautiful hand stitching and a kitten heel. 4. Visit the Xul Museum. 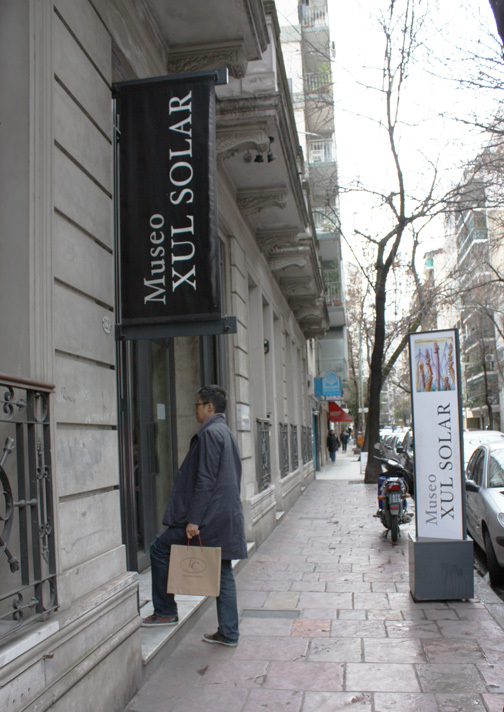 Do not miss this gem of a museum that houses Alejandro Xul Solar’s work. I had never heard of this artist but am now a fan. He trained as an architect which is evident in some pieces. His work has been compared to Paul Klee and Wassily Kandinsky. The building design is awesome and the small museum shop sells very high quality prints on hand made paper. 5. Go for a run in the Palermo Parks. If you are a runner, you will love running in these parks. Here is the 5 mile route that I ran most days and highly recommend. 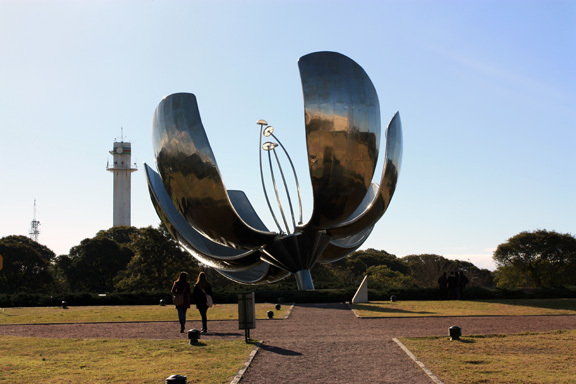 The route brings you past the very cool large metal flower Floris Genérica that hovers over a reflecting pool – the petals open and close daily. 6. Walk around Puerto Madero to see the Mujer Bridge designed by the awesome Santiago Calatrava and then go for a cocktail at the Philip Stark designed Faena Hotel & Universe. 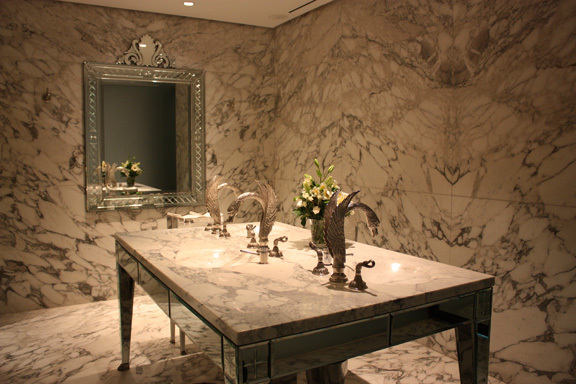 Be sure to check out the beautifully designed restrooms that feature an over the top hand crafted swan faucet. It’s fabulous! 7. See a Tango show in the city where this beautiful dance was invented. This is a must but keep in mind that the shows are for tourists and many are overpriced or a bit cheesy. I wanted a comparison so we saw two shows: Esquina Carlos Gardel which offers a dinner (we opted for the bar only which I’d recommend) in a beautiful space that evokes the glamour of the 40’s. We also saw a show at the Borges Cultural Center which actually seemed to attract some locals and did not offer dinner as it was in a regular theatre. Both shows were good and I loved the dancing but personally did not care for the singing (Borges had a bit more singing). I think seeing one show on a visit to BA is enough and I’d recommend the one at the Borges Cultural Center because it was about a third of the price and I liked that it didn’t have the dinner which seemed crowded and chaotic. 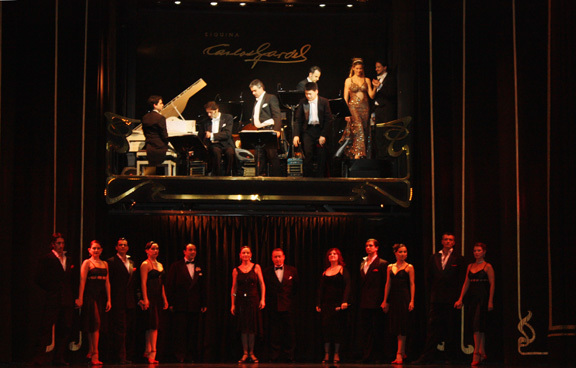 The dancers at Gardel were perhaps a bit more talented but, unless you are a tango aficionado, it shouldn’t matter. 8. Dine at a closed door restaurant (known as puertas cerradas) which is a private home that serves meals with reservations. I really wanted to try Casa Felix since they specialize in vegetarian fare but ironically they were on tour in the US. Here is a link to some others to try. 9. Visit Celedonio. 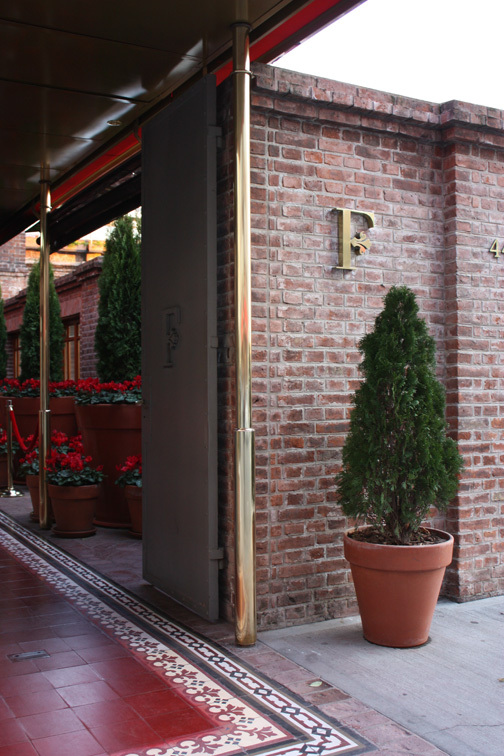 If you like jewelry, do NOT miss this exquisite boutique. The designs are gorgeous! I was lucky to be treated to a lovely amethyst necklace and earrings. The designer was previously an architect and has a wonderful eye. 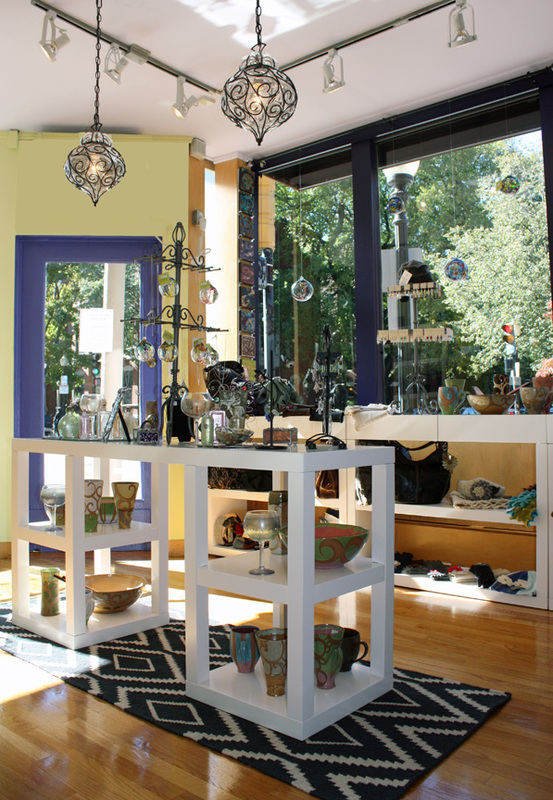 They also carry some light fixtures and traditional woven rugs that are hand crafted in the northern parts of Argentina. 10. 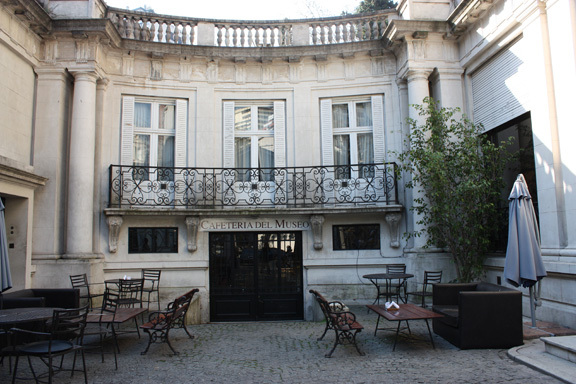 Visit the Museo Metropolitano which is adjacent to Celedonio and separated by a lovely courtyard cafe. It is worth a peek inside for the architecture and to check the current exhibit. 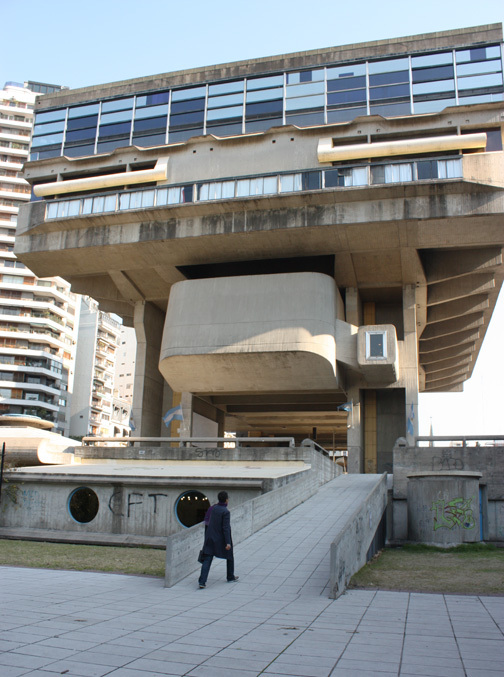 I didn’t find this in any guidebooks but this building is a gem and the surrounding area (located around the corner from the MALBA) has some of the loveliest architecture in BA. 11. 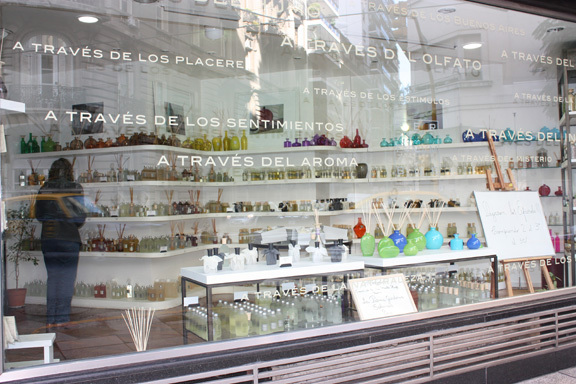 Perfumumbue is a Recoleta shop specializing in fragrance for home and body. 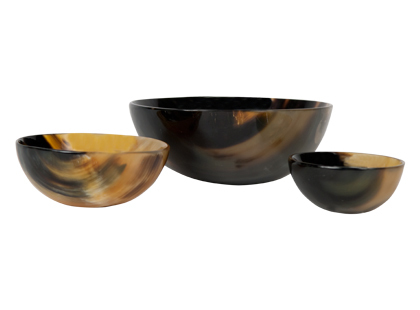 They have a beautiful selection of colored glass vessels that can be used as room diffusers. 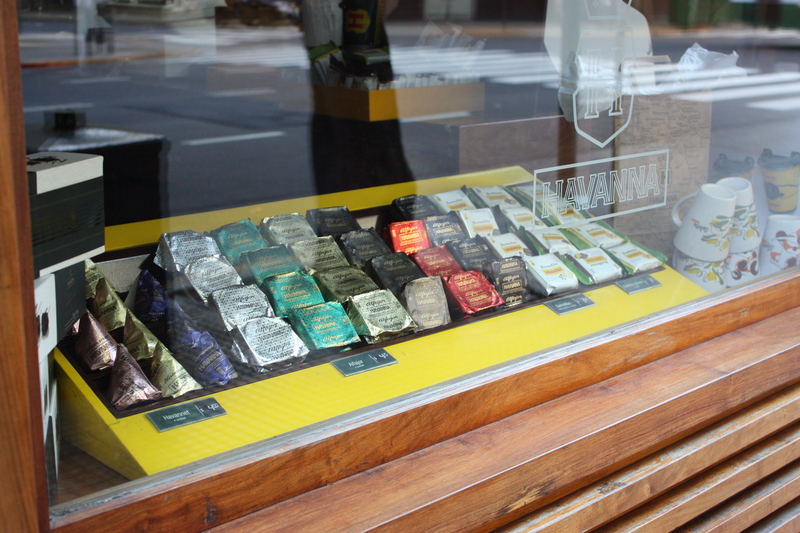 Packaging and displays are well designed. A perfect place to pick up a special gift. 12. 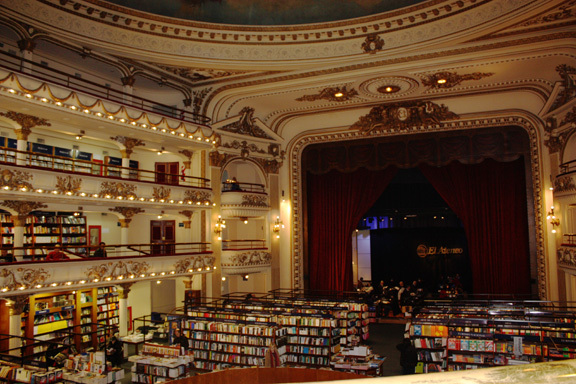 Stop by the El Ateneo Grand Splendid a theater turned bookshop on Ave. Santa Fe in Barrio Norte. You can read on the balcony or have a coffee at the cafe on the stage. 13. 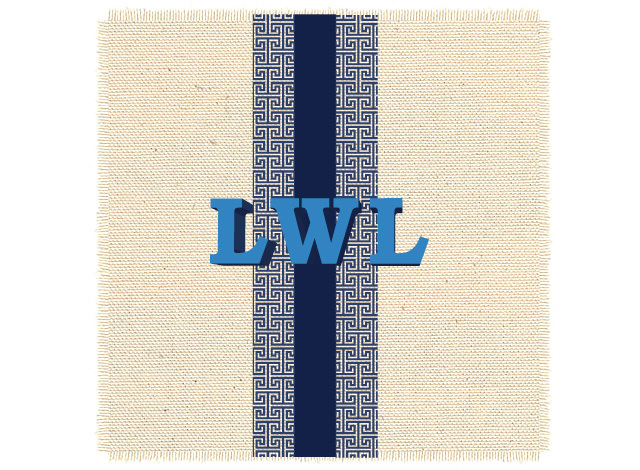 Shop for a traditional Argentinian woven rug. Elementos Argentinos in Palermo has a great selection of new and vintage pieces, many with brilliant colors. 14. 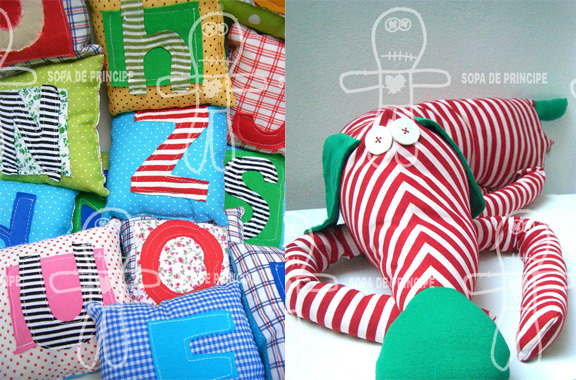 Visit Sope de Principe in Palermo Viejo for soft sewn dolls and accessories for children (boys and girls). Wonderful designs and very unique gifts for little ones. 15. Libros del Pasaje is a bookshop, library and music store across the street from Sope de Principe – it has a very cool vibe and the bar/cafe seems to be a popular spot. 16. Sample the sweets. 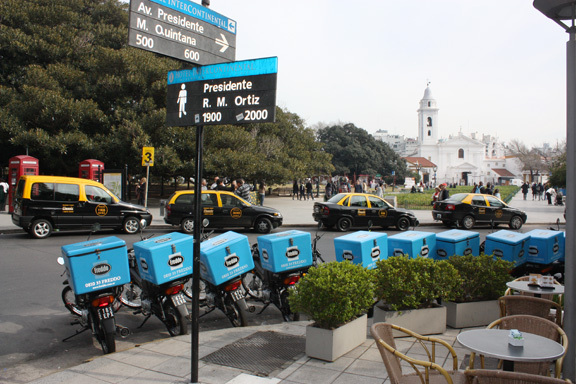 Buenos Aires is a late city and Porteños, as BA residents are called, do not eat dinner until 10 or 11pm so they will often snack between lunch and dinner – typcially on medialunas (also eaten at breakfast) which are essentially small croissants with a sweet glaze. 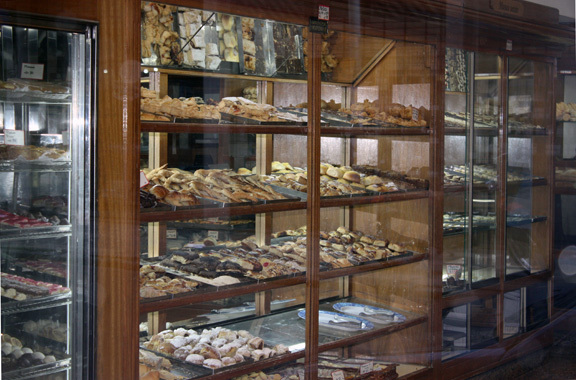 We were lucky to be staying a few doors down from an excellent bakery called La Nueva Capital at 1242/44 Junin where the medialunas and all pastries were to die for! Some were filled with the sweet goodness of dolce de leche which is similar to caramel. Everything we tried here was fresh and delicious – I’d highly recommend this place. Another typical sweet to try is an alfajor – I believe there are several versions but it is typcially two cookies sandwaiched together like an oreo with dolce de leche. My favorites were dipped in chocolate and I made the mistake of bringing a box home. They are really good frozen. 17. Visit the National Library not for the brutalist style architecture but for the fantastic panoramic city views from the 5th floor. You’ll need to put your things in a locker before entering and no photos are allowed but it is totally worth it. There was a small cafe on another floor with a few outdoor tables but we didn’t check it out. 18. San Telmo on Sunday for the antiques market and tons of antique stores in the area. Even if you don’t plan to buy, it’s worth a visit for the architecture and people watching. 19. 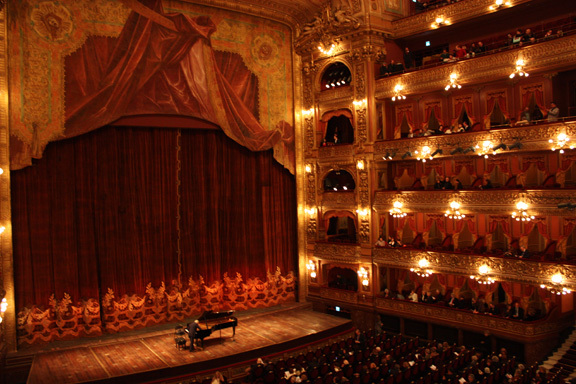 See a performance at the Teatro Colón. One of the highlights of the trip was seeing a concert at the BA’s world famous opera house which just reopened this year after several years of renovations. Unfortunately, an opera was not scheduled during our visit but we were able to see the very talented pianist, Nelson Goerner. It really didn’t matter because the space itself is just incredible and clearly deserves its status of one of the best opera houses in the world. If you do not enjoy opera or classical music, public tours are offered and it is worth checking out just to see the space. 20. Drink Argentinian wines! Nearly every wine we tried was good – both high and low price points. To add to our collection of wines from our travels, we brought back a 2006 Malbec from Miguel Escorihuela Gascon which we hope will age well. Obviously excellent Malbecs and reds but also some nice white wines produced mainly in the north near Salta. The season wasn’t right this time but Salta and Mendoza are definitely on the itinerary for my next visit to Argentina which I hope is soon. 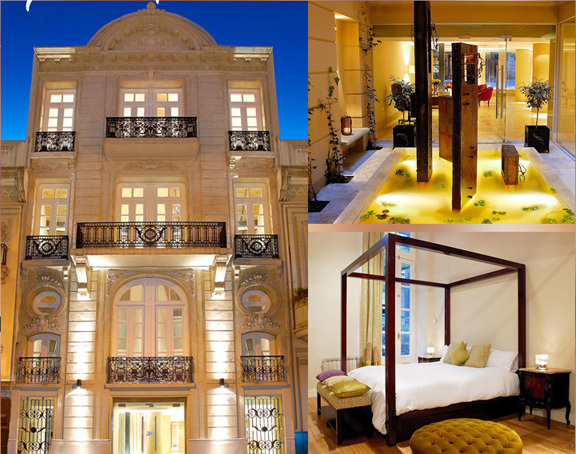 We stayed at a duplex apartment at the Poetry Building in Recoleta, one of the most elegant areas of Buenos Aires which is also centrally located. I highly recommend it and will add the link to my full review on Tripadvisor once it is complete. UPDATE: Here is my complete review of the Poetry apartments on Trip Advisor. Look forward to sharing some great design finds and inspiration upon our return!! Most people would agree that one of the best things about summer is outdoor living. 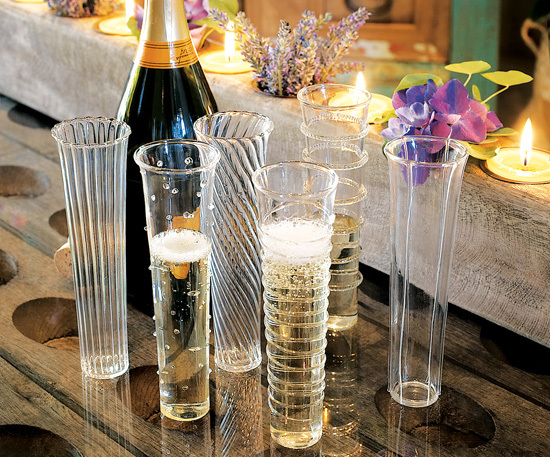 Whether dining alfresco or lounging with refreshing cocktails (or champagne!) poolside, few things are better in life than creating summertime memories with family and friends! 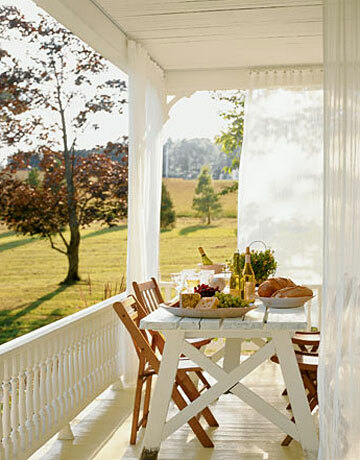 Earlier this year, I had a couple of fun projects that included outdoor living spaces and though I can’t share those projects just yet, I did want to post some of my favorite inspirational images of outdoor spaces. 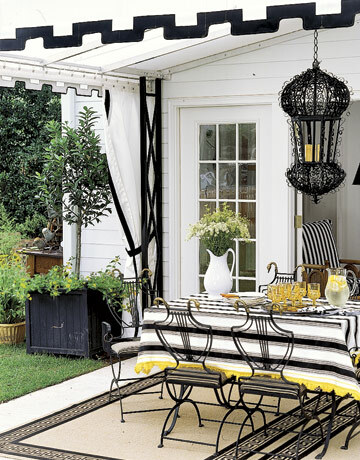 Black & white is classic, sophisticated and timeless – indoors and out. Black & white……….with a bit of Yellow……another winning combination. The neutral palette is soothing and blends with natural surroundings. Simple. Elegant. Perfect. 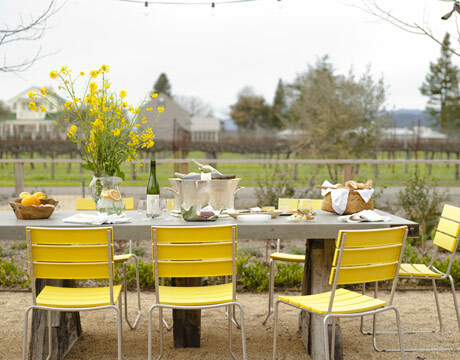 No need to spend a fortune to host a fabulous outdoor dinner party! 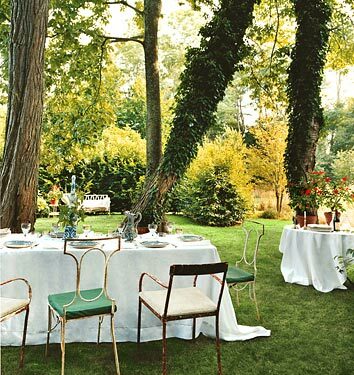 Mismatched, tattered chairs paired with long formal table linens creates a casually elegant vibe. 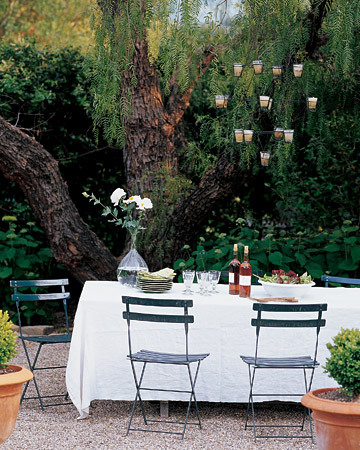 A whimsical chandelier composed of candles, table lines and simple flower arrangement are all it takes to make these common (and inexpensive) outdoor folding chairs and gravel ground seem totally chic. In place of this chandelier, one could also use a grouping of inexpensive paper lanterns in one or two colors of various sizes. When you have a beautiful view and great architecture, there is no need to go fancy with the furniture and table setting. Keep it low key and simple. Allow the focus to be the views and company! 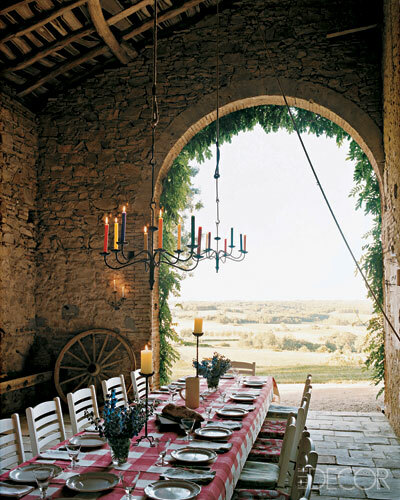 Rustic farmhouse table evokes a French countryside feeling. 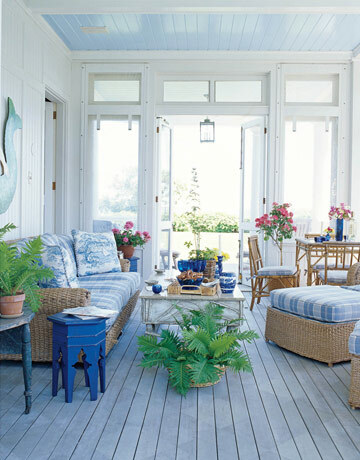 This enclosed porch is fresh and comfortable due to the color palette and openness. Notice the beadboard ceiling is painted a pale blue which is subtle but adds a bit of interest and ties the color scheme together. Too often, the ceiling is neglected – it doesn’t always need to be white. If you are afraid of a bold color, a simple trick that designers sometimes use is to specify the ceiling paint to be tinted with 25% of the wall color which creates a more cohesive, less harsh appearance. 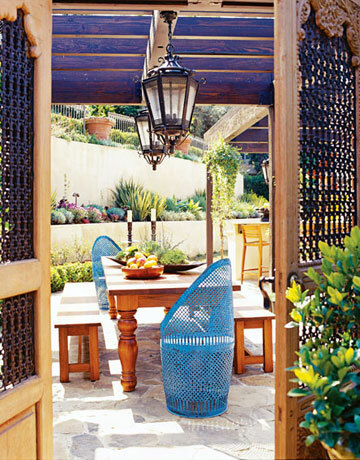 These two oversized lanterns above the dining table are just great! 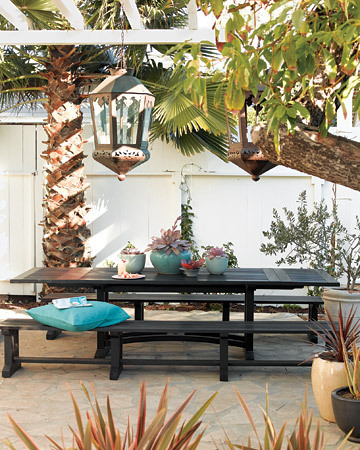 I am obsessed with light fixtures and the outdoors are no exception. Incorporate color! No need to stay with neutrals -the blue works wonderfully here. 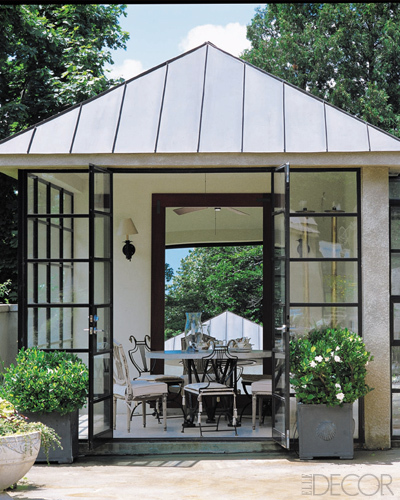 This outdoor space is as chic and comfortable as any indoor space. 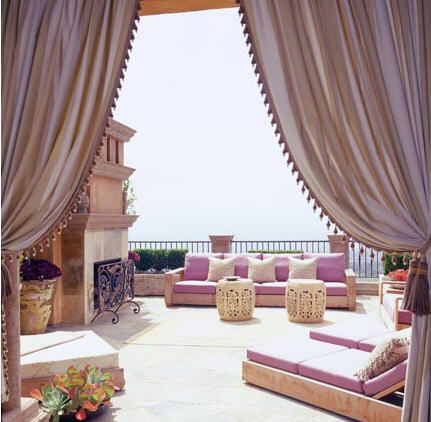 The unexpected lilac color scheme for the outdoors is refreshing and works well with the neutral colors of the stone. 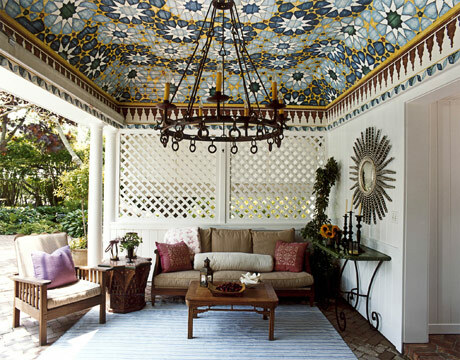 Ceiling comprised of typical Moroccan patterned tiles. I like an eclectic interior that is acheived by combining different styles and periods as well as mixing high and lower end pieces. Ever since visiting Morocco, I have loved the design aesthetic and sometimes like to include small touches such as a pierced metal lantern or traditional morrocan textiles – it adds interest and personality. Travel is a great source for inspiration and I am always on the lookout for new ideas, color combinations, textures, etc. on trips. 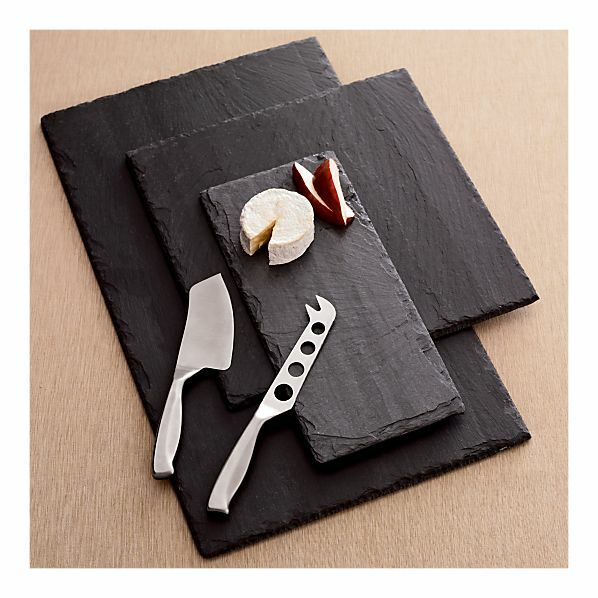 To personalize and create an original space, incorporate one or two elements from places that you’ve traveled. Be careful not to go overboard, however – outside of Disney world, a “themed” interior is not the goal. 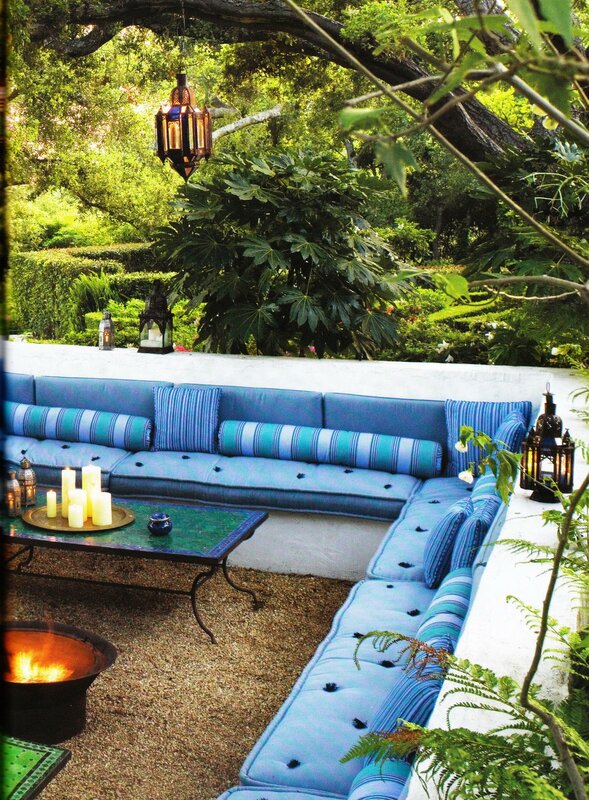 Incorporating textiles into outdoor decor makes outdoor spaces more attractive and comfortable. 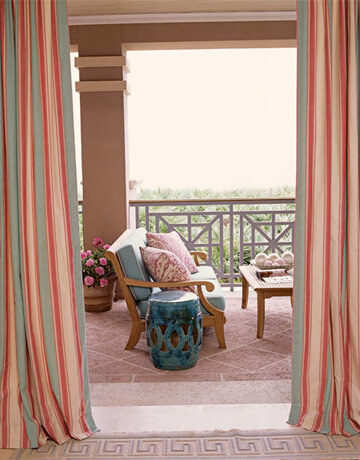 There are many beautiful textiles that are suitable for outdoor use for applications such as cushions, pillows and drapes. 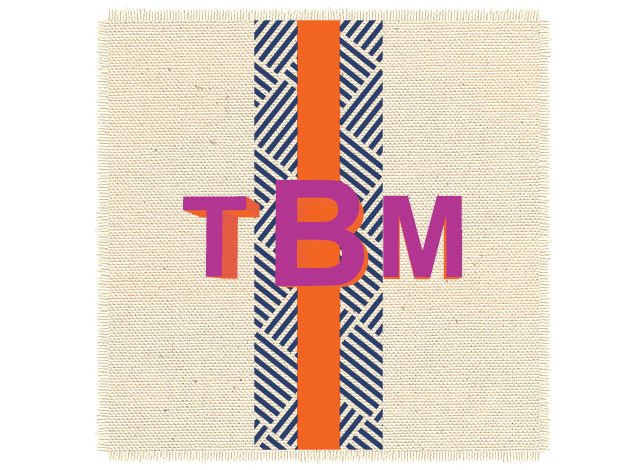 A few favorites are the fashion designer Trina Turk’s line for F. Schumacher and Perennials. 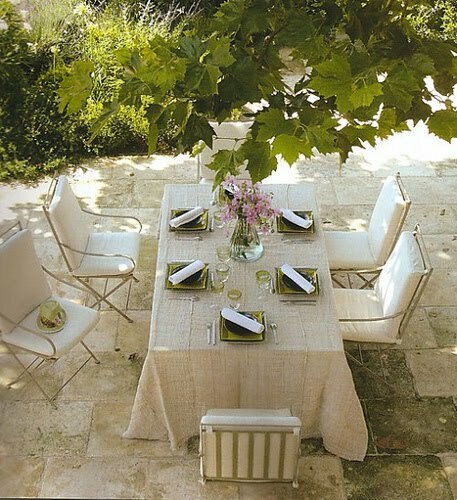 A favorite resource for hi-end outdoor furniture is Janus et Cie (to the trade only). 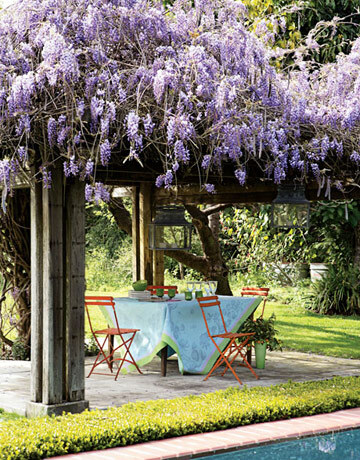 Love the wisteria, always reminds me of the time I spent living and traveling in Italy. 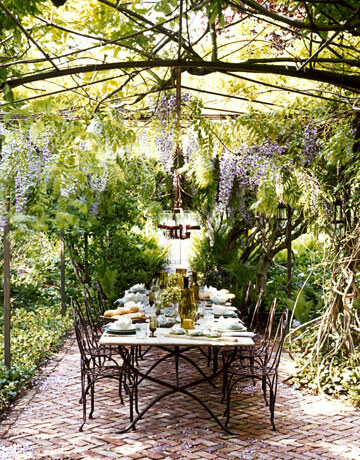 A patio in a herringbone pattern raises ordinary brick to another level. Gray and yellow is a favorite color combination but honestly with this view, it really doesn’t matter……this is my probably my all time dream weekend home locations! 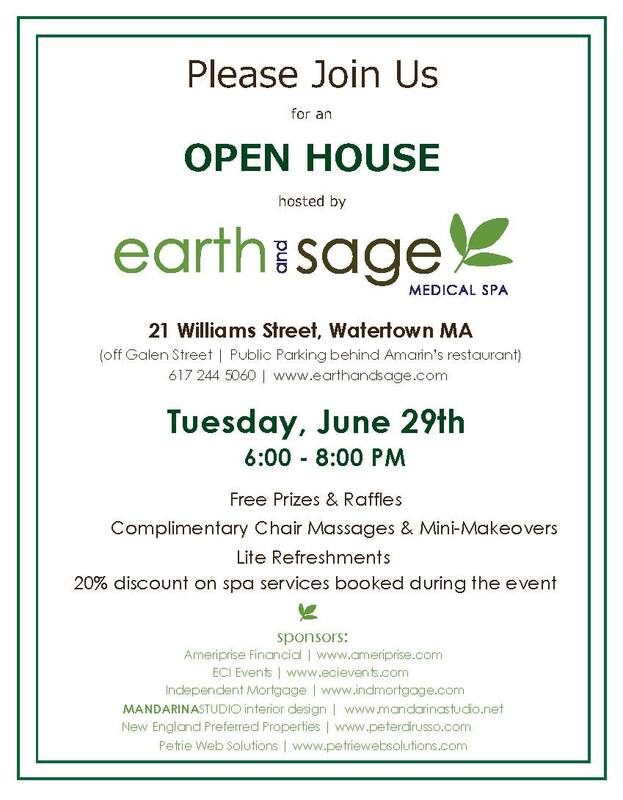 You’re invited to come celebrate summer, health & wellness at this OPEN HOUSE event hosted by the fabulous EARTH & SAGE Medical Spa in Watertown, MA. If you are in the Boston area, please come by for socializing, networking and free stuff! MANDARINA STUDIO interior design will be contributing a surprise raffle. Feel free to invite family, friends and colleagues. Please let me know if you plan to attend or have any questions: info@mandarinastudio.net.